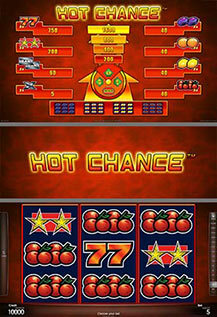 Take your „Hot Chance™“ and win large prizes with special symbol combinations! Unforgettable enjoyment and fun are guaranteed with this enthralling 5-line, 3-reel game in Full HD quality. PLUMS, ORANGES, LEMONS or CHERRIES trigger the „Hot Chance Feature“ when 9 identical fruit symbols appear on each position of the three reels (Special bonus). The Rewin Feature symbol can double the win up to three times.